OpenCart 2 has a build-in affiliate module which allows you to create, track and manage affiliates. As a typical affiliate program, your affiliates will generate commissions upon referring customers to your store. Commissions are generated based on your referees and can be paid via three different methods. In this tutorial we will guide you on how to activate and configure your OpenCart 2 affiliate program and manage your affiliates. 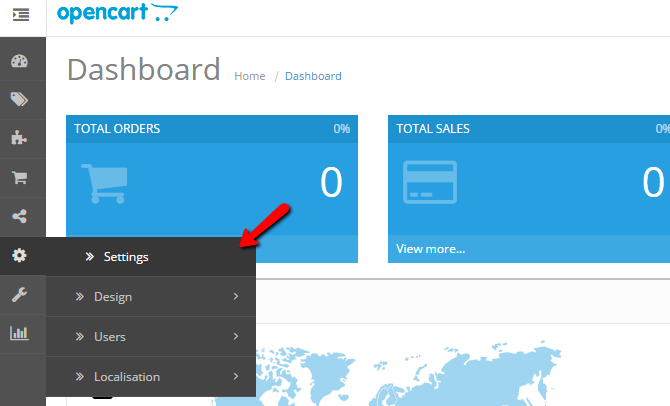 To access the Affiliate program settings, please login your OpenCart 2 admin dashboard and refer to the Settings section via the main navigation menu. Click on the edit button next to your store name to refer to the Settings section and select the Options tab to access the OpenCart 2 configurable options. Affiliate Requires Approval: Set this to Yes in case you would like to manually approve affiliates before being activated. Automatic Commission: Set this option to Yes in case you would like to have affiliate commissions added automatically after every paid order. Setting this option to No will require manual approval of every commission. Affiliate Commission percent: Set the percentage of each paid order that will be commissioned to your affiliates. Affiliate Terms: Select the page that includes your Affiliate Terms of Service. Usually this is the ‘Terms & Conditions’ page but you can create or use a separate page for your Affiliate Terms of Service. New Affiliate Alert Mail: This option allows you to choose whether you should receive an email upon new affiliate sign up. When you are ready with your settings, please click on the save icon at the top right corner of your screen. Now that your affiliate program is active and configured your affiliates can sign up directly via your website via the Affiliate Program page accessible by default via the footer menu link. To manage your existing store affiliates or create new affiliates you may refer to the Marketing, Affiliates section via the main navigation menu of the OpenCart 2 admin dashboard. Here you can add a new affiliate by using the add icon at the top right corner of your screen. There are two important configuration settings for each affiliate – the affiliate personal information and contacts and the commissions settings including the affiliate commission percentage and payout method. First, fill in the affiliate personal information and all mandatory fields. Please note that a tracking code will be generated automatically for your affiliate by you can add a custom tracking code. This code is used to track your affiliate sales. When you have all personal details filled in, make sure that the affiliate status is set to Enabled. Now you should proceed with the Payment Details for the affiliate. Please scroll to the top of the page and click on the Payment Details tab. 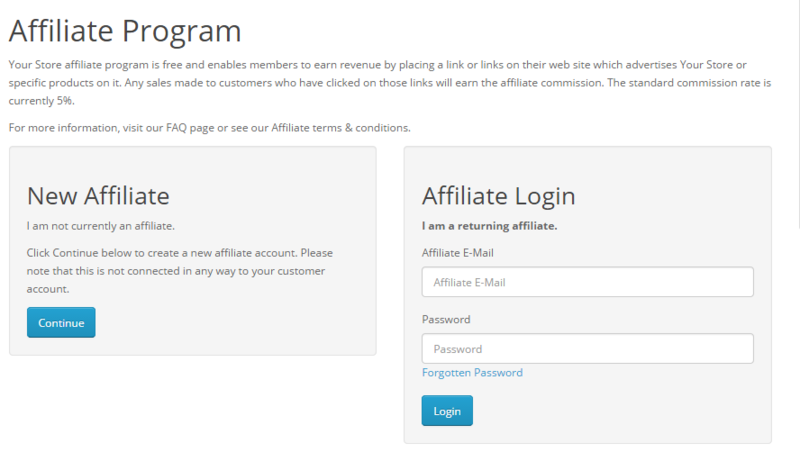 Here you should configure the affiliate Commission percentage and the payout method. When you have the desired settings applied click on the save icon to complete the process. Now you should see your affiliate on the Affiliate List page. Via this page you can manage all of your affiliates. To change the existing settings for any affiliate, apply custom commission percentage or change personal details, please click on the edit icon for the affiliate. Via the Affiliate Configuration page you can modify both the personal and payment settings for the affiliate as well as review all transactions generated for this affiliate via the ‘Transactions’ tab. Additionally, you may manually add a transaction to a specific affiliate.